Our seed order is in. Everything from eggplant to watermelon to kale ordered and (mostly) received. In a great feat of concentration, our 2012 Organic System Plan has been sent in to the Montana certifying entity, and the planting plan for 2012 is on the verge of completion. To cap it all, our taxes are done. Margaret and I spend most of our time on a ginormous puzzle or with a nose in a book. As the season creeps closer and closer, the Farm Shares begin to roll in and our pantry is relieved of more and more jars. As of 2 weeks ago, the bees are still alive and well. We’ve begun to sprout roughly 400 asparagus seeds, which will be a challenge to fit in our greenhouse before they’re transplanted in the spring. The goats are fat and happy and one is (fingers crossed) growing a couple little goats inside. We’re looking forward to 2012 and hoping to fill it with baby plants, baby goats, and honey. Our 2012 mascot, Hipster Coda, wishes you a very happy new year. When introducing bees to their new home, the smart beekeeper waits for a bright and sunny day with more of the same to follow. 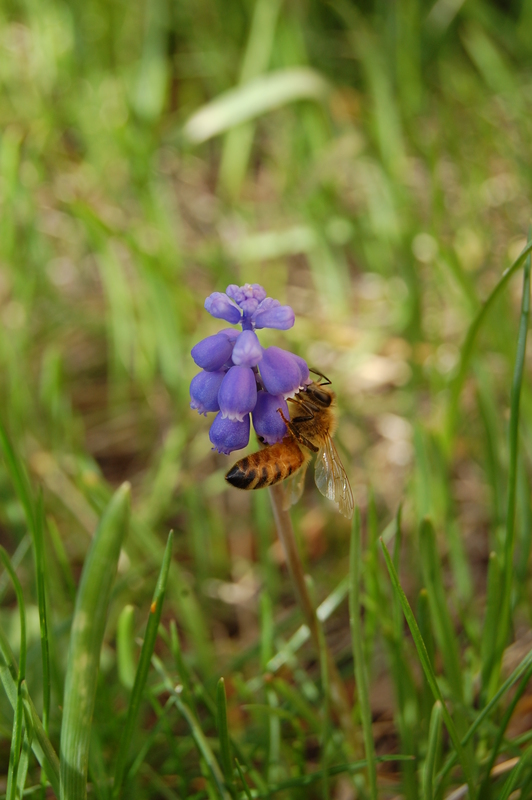 This allows them to forage for nectar and pollen to feed themselves while they build new comb and re-furbish their hive. Friday was grey and cool, with more of the same for the weekend, but I was so excited to have the bees in my paws that I installed the bees into their hives anyway… before I really thought it through. Actually, I was sure I had killed them because of my impatience and bad timing. But, lo and behold, the bees are flying today. Assuming the queen survived the ordeal, they will be just fine. 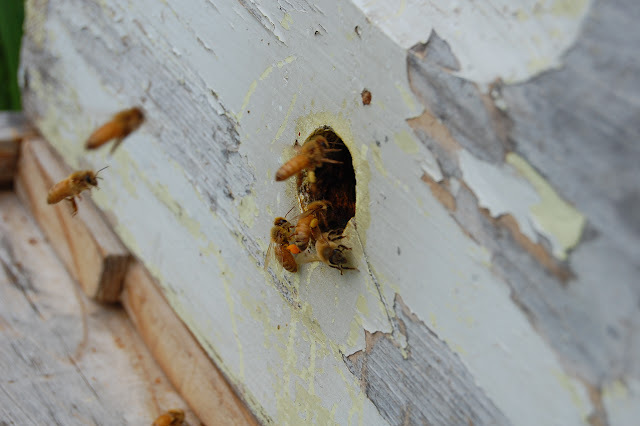 If I don’t see the bees bringing pollen into the hive by Wednesday or Thursday, I’ll take a peek inside to find either the queen or brood (eggs/larvae). If those are absent as well, I’ll have to find myself a new queen or three. If you’ve never seen it happen, installing bees is a thrilling and mostly painless experience. See below! The bees arrived in Polson, MT in these boxes (called packages). Each weighs approximately 3lbs and contains about 10,000 working bees and one queen. They have made the journey safely, fed by the can of sugar water you see inserted into the middle of the package. To the right of that jar, is a metal tab connected to the cage the queen is in. Here the packages are in the back of the truck. I’ve already suited up and entered into our brand new bee yard with the packages. Although bees are extraordinarily tame and calm when they don’t have a hive or baby bees to defend, I always wear a veil (I’ve never been stung in the eye, but I don’t want to know what it feels like). This is the third hive I installed that morning. When I did the first two hives, I wasn’t wearing gloves and got stung on my hand – when bees sting they let out a pheromone to tell other bees to attack. So I put on my gloves for number three. The queen. She’s in a cage for a couple reasons. For one, it makes finding her and not accidentally squishing her really easy. Secondly, the queen and the bees in the that package are almost always from different hives. Bees give off pheromones that distinguish them from other hives, like a family smell. The queen is in the cage so that the bees can get used to her smell and accept it as their own before she’s let out. If she were just thrown into their hive, they’d probably kill her as they would any other intruder. As time goes on, she’ll eat her way out of her cage via a candy cork and by that time the bees will have accepted her. Next I took the hive apart so I could dump the bees into the hive. First the queen goes in. The bees will stay close to where she is and make their way towards her if they get separated. Those pictures of people covered in bees? They’re able to do that because they have a queen (usually in a cage) attached to them somewhere, and the swarm of bees surrounds her and keeps close. Anyway, I took some of the top bars out so the bees would fall more easily into the hive rather than fall out onto the ground. More bees in the hive means less energy they have to expend before they can start gathering nectar (or sugar water which I had set out for them) and building comb. The fun part! I take the package and "tap" the side of it until almost all the bees fall into the hive. And when I say tap… I mean bang. Hard. 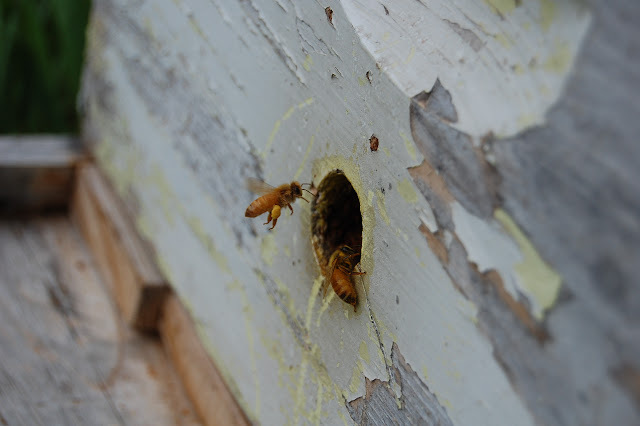 Thanks to Margaret, we have these great action shots of the bees pouring out of the package. Now that the bees are all in the hive with the queen, I put the package somewhere near the hive so the bees that haven’t been forced into the hive can find their way into it from a moderately small distance away. As the bees make their way into their new home, I help them along so I can put box number two back on top of box number one. And the bars go back onto the box. Bees inside, the second box goes on top and then then roof onto that. Our friend Kristen watches and prepares to install her own bees back at her farm in Moeise. The only thing I love more than watching bees is taking pictures of them. Many of you know that I’m obsessed with bees and beekeeping. This year I made my own bee boxes (i.e. bee hives). My boxes are a variation on the Warre style hive. There’s a great explanation about this kind of hive, as well as plans if you’re interested in building your own at TheBeeSpace. 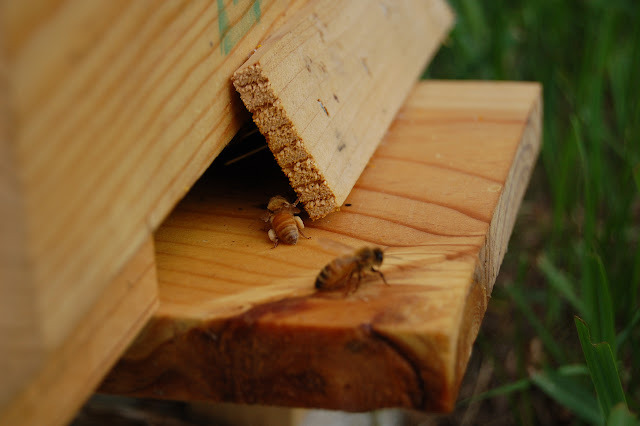 The coolest thing about my boxes is that they started out as old worn down Langstroth hives. 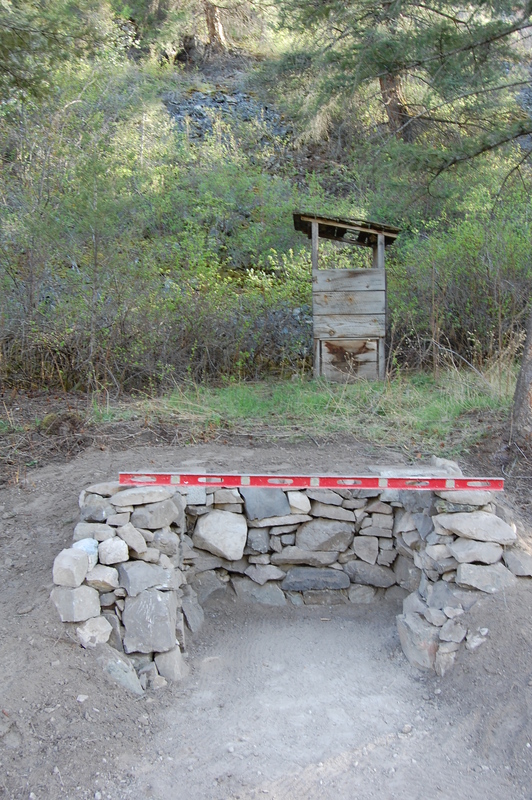 These are the hives you’ll see honey producers and many hobby beekeepers use, they’re by far the most common. I took these old boxes, tore them apart, and trucked them to Home Resource – Missoula’s totally awesome re-use lumber and household appliance store that has a professional wood shop in the back where you can rent time… which I do. There I sanded off the worn and weathered wood until the boards looked almost like new. Because Langstroth boxes are so much bigger than my Warre hives, I was able to saw off the split finger joints and make stronger new joints. The wood looked nice, and the boxes looked really nice, but it wasn’t until I painted them with lindseed oil (for natural preservation and protection) that the beauty wood really came through. Most of this is cedar. Regardless, the bees arrive Friday. If you’re in the area and you want to be a part of the process, let me know – it’s quick, painless, and really thrilling.